MagicPlot application include 10 most usable palette presets for color map plots. More presets can be found on this page. This is a collection of color map palettes that have been designed to have uniform perceptual contrast over their whole range. More information can be found on author's site: http://peterkovesi.com/projects/colourmaps/index.html and paper: arXiv:1509.03700 [cs.GR] 2015. These colour maps are released under the Creative Commons BY License, a summary of the conditions can be found here. Open the properties dialog of a Color Map Plot you have created. 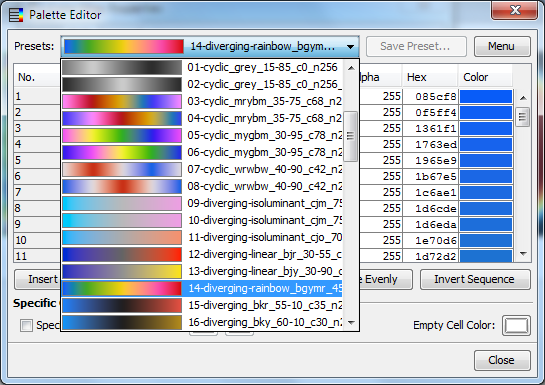 Press the 'Customize…' button in the 'Style' tab, the Palette Editor will appear. Click on 'Menu' button and select 'Browse Presets Folder', a folder will be opened. Copy the contents of the zip-archive (50 .mppc files) to the opened folder. 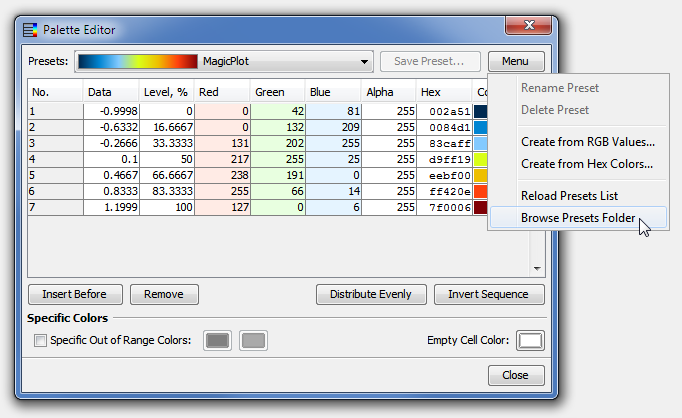 Use the 'Reload Presets List' menu item or restart MagicPlot to update the presets list in the application.